They're running amuck and we need your help to put a stop to their shenanigans. Spin these reels to capture the gang of chimps and bring order to the city. You'll definitely be handsomely rewarded. The main chimp is the Mighty Chimp. He's the big boss, so you'll want to spin this great ape as much as possible. He only appears on selected reels but acts as a wild symbol and will help you spin in more wins. He also doubles all prizes when he appears in a winning combination. Keep an eye out for citizens in need of help, particularly the helpless blond beauty. If you can spin one to five of these ladies on an active pay line you could win up to 2500 times your line bet. 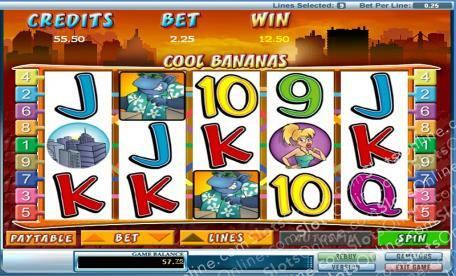 Two to five cityscapes will also payout big, with five of them getting you 1000 times your line bet. There are also sunglasses and banana splits. Each brings in up to 500 times your line bet if you spin two to five of them. You'll want to lure the Mighty Chimp into your trap. Spin bananas to do this. This yellow fruit acts as a scatter. Not only will it multiply your total bet, but it will trigger a bonus feature that will see you winning even more cash prizes. See if you can conquer the Mighty Chimp for a chance to save the city and bring in plenty of big wins! The banana symbol acts as a scatter. If you spin two to five of them anywhere on the board and you will get up to 100 times your total bet. Three or more will trigger the Cool Banana bonus feature. The Mighty Monkey is a wild symbol. He only appears on reels 2, 3 and 4 but will substitute for all other symbols except scatters. He will also double prizes when he appears in a winning combination. If you spin three or more banana symbols in sequence from left to right or right to left and you will trigger the Cool Banana bonus feature. You'll have to help Mighty Monkey climb the skyscraper. He'll have to pass six obstacles and each one you pass will earn you a bonus prize. PartyGaming software allows you to use an auto spin feature; however, it is only for players using real money. Simply click on the Auto button and and a window will pop up that allows you to customize the auto spin for perfect hands free playing. Some of the options include number of spins you want to take before it stops, stopping after a big win, spinning until a feature of free games are triggered, plus many more. The spin will pause for a couple of second between each spin to allow you to view your winnings. To stop the auto spin, simply press the stop auto button.